Shots have been fired over Nagorno-Karabakh, and leaders in Baku and Yerevan demand national unity. But behind the patriotic hysteria is a cry for social justice. A couple of years ago, a friend and I visited the city of Goris in southern Armenia, a de-facto stone’s throw from the de-facto border with the de-facto Republic of Nagorno-Karabakh. Walking in the hills and cliffs around Goris, a small city of 20,000, we met Vesmir. Hospitable and talkative to a fault, Vesmir introduced us to his family, who offered us hot Jingalov Hats, a herb-filled flatbread and speciality of Karabakh and southern Armenia. As we left later that evening, Vesmir hurried after us into the night and, bashfully, asked for a couple of thousand dram to cover the hospitality. Armenian hospitality should come free, he explained, but these days, well, that hospitality didn’t come so easily. Times were tough. They usually are in rural Armenia. Earlier that day, Vesmir had shared his thoughts on his family’s situation. Like many, he said, he had fought in the war in Karabakh. His resentment — at the cost of the war, not at its outcome — came surprisingly freely. They lived better over in Karabakh, he insisted. The roads into to Stepanakert are paved with gold or, at least, donations from the Armenian diaspora. As fighting has flared up again between Armenian and Azerbaijani forces in Nagorno-Karabakh, I’m eager to decrypt exactly what Vesmir meant. What’s scary about the situation is how little we know. Or rather, how frustratingly little we can know. But what we do know about the recent hostilities between Armenian and Azerbaijani forces is chilling. In the pre-dawn hours of 2 April, the Azerbaijani armed forces launched a combined attack on Karabakh Armenian positions, in what appears to be an attempt to redraw the line of contact. This is the most serious fighting since the ceasefire of 1994. Both sides claim to have inflicted large numbers of casualties, and armour, artillery and helicopters were deployed. Azerbaijani forces were able to wrestle a small area around the village of Talish from Karabakh Armenian control, though they were soon expelled. 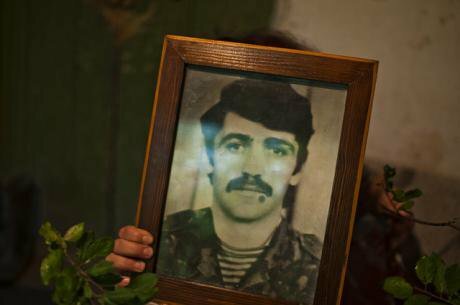 A resident of Shusha displays a photo of a family member killed in the Nagorno-Karabakh War (1991-1994). Photo CC: Marco Fieber / Flickr. Some rights reserved.While Armenian sources are many, few foreign correspondents or freelancers report regularly (if at all) from the unrecognised republic. The authorities in Baku keep an updated list online of those barred from Azerbaijan due to their visits to Nagorno-Karabakh. All things considered, international journalists weigh up their options. A report from Stepanakert may not be the wisest career move, particularly if the price is never working in Azerbaijan. The price for Armenian media is indifference to everything but glory. Hrant Gadarigian, an editor at Armenia’s leading investigative outlet Hetq, writes of the rise of “Artsakh Amnesia”, whereby it takes ever more dead Armenian servicemen for media to express an interest in the fates of Karabakh’s residents. A case in point, broadly speaking, was 20-year old soldier Karam Sloyan, a member of Armenia’s Yazidi minority. On 4 April, Sloyan was killed by Azerbaijani soldiers. (According to some sources, he was beheaded: an image has been circulated as proof.) Several days later, journalist Ruzan Minasyan from Aravot visited his grieving family in Artashavan, a village of some 624 people in central Armenia. The Sloyan family’s house had bare walls, an earthen floor which remained damp despite the best efforts of their small, wood-burning stove. Relatives would be spending the night here too, the parents told the journalist. Minasyan couldn’t imagine how. The daily lives of people like Sloyan may not be fitting subject matter at a time of national euphoria — neither the current residents of the de-facto republic, nor the Azeri refugees whose poor conditions in Baku and Sumgayit persist to this day alongside obscene oil-driven wealth. Karabakh controls Armenia because in times of war and uncertainty, sitting governments tell themselves and their peoples that they deserve national unity. More often than not, they get it. Armenia’s tender political position and Azerbaijan’s open wounds make the demand practically bottomless. You could almost call it a shock doctrine in reverse; a crisis on the frontline justifies not rocking the boat. But dissent has boiled over. Over the border, Azerbaijan’s 2016 has seen oil prices tumble and protests break out across the country. As the elite refuses to tighten its belts, real wages and livelihoods have been hit — and hard. Armenia has fared a little better, though has also seen a steep decline in living standards. The country faces a large drop in remittances from Russia, which account for nearly a third of its GNP, while 30% of Armenians survive off less than 4,000 dram (£58) a month. 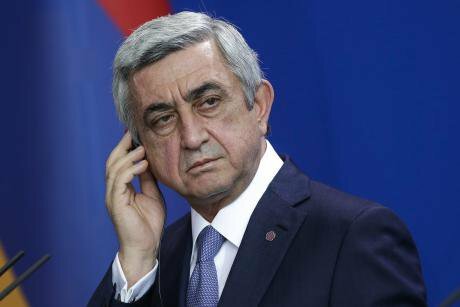 Domestically, president Serzh Sargsyan is more or less secure after his victory in a referendum on constitutional amendments. Armenians have taken to the streets, too — whether against electoral fraud, or rising electricity prices in what became known as Electric Yerevan. 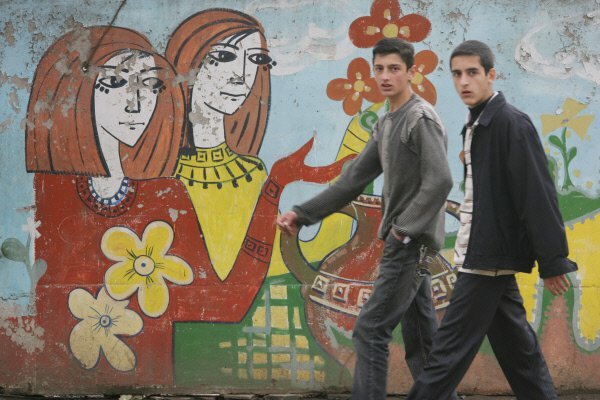 Two boys walk the streets of Stepanakert, Nagorno-Karabakh region, 2008. Photo (c): Ilya Pitalev / visual RIAN. All rights reserved.Though they may be divided by war, Armenian and Azerbaijani officials both preside over a large wealth gap, and have featured in the recent Panama Papers. There are new revelations about the ruling Aliyev family’s mining interests, though wartime solidarity probably dampened the public outrage. Indeed, enterprising Twitter users in Azerbaijan even came up with a hashtag to accompany the Panama Papers: #indiyerideyil. It means “now is not the time”. The fallout for Armenia has concerned security official Mihran Poghosyan. Linked to several building companies which have won lucrative state tenders, Poghosyan is considered to be under the protection of Armenian president Serzh Sargsyan. Poghosyan resigned from his position yesterday, saying that he was saddened that his name appeared alongside Ilham Aliyev’s. Poghosyan “found it unacceptable that [he] might be the reason for any possible comparison to be drawn between Armenia and despotic Azerbaijan”. In Yerevan, little public oversight of defence spending has led to Armenian officials caught with their hand in the till. Corruption in the Azerbaijani military establishment is also rife. While analysts have often pointed to the vast disparity in military budgets of the two states (Azerbaijan’s has been estimated at more than Armenia’s entire annual state budget), much of this funding disappears well before it reaches the barracks. Neither Yerevan nor Karabakh’s de-facto government in Stepanakert had any convincing motive to throw in their luck and revise the status quo in Nagorno-Karabakh. The Aliyev regime, on the other hand, knows the value of a small war, whatever the scale of the prize. 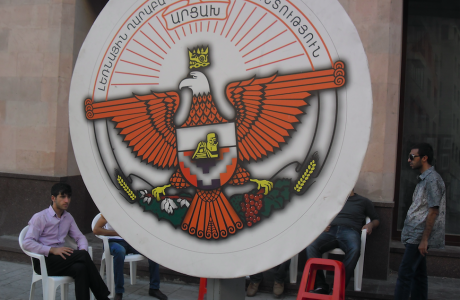 The state arms of the unrecognised Republic of Nagorno-Karabakh on the streets of Yerevan, 2014. Photo courtesy of the author.Putin’s annexation of Crimea led to soaring approval ratings and put the opposition on the back foot, and Ilham Aliyev has also enjoyed a savoured moment of solidarity. It’s something he may have felt was slipping from view in recent months. Azerbaijan’s first presidents since independence, Ayaz Mutabilov and Abülfaz Elchibey, were upended by defeats on the battlefield. With the coming of Heydar Aliyev to the presidency in 1993, Azerbaijan found a leader (and a dynasty) who could at least manage — if not quite win — the conflict. In contrast, Armenia’s leaders made, rather than ended, their careers on the battlefields of Karabakh. Current president Serzh Sargsyan is from Karabakh’s capital Stepanakert, and played a key role in uniting its various paramilitary groups in the early 1990s. Armenia’s second president Robert Kocharian was also a Karabakh native, once serving as military commander-in-chief and both prime minister and president of its separatist government. First president Levon Ter-Petrosyan was from the Armenian diaspora, a native of the Syrian city of Aleppo whose family emigrated to Soviet Armenia in 1948. The erstwhile academic was one of the most influential leaders of the Karabakh Committee, which was founded in 1988 to unite Karabakh with Armenia. Petrosyan’s political career is an example of Karabakh’s reward for victory — and its price for defeat. Ter-Petrosyan had a little help from his comrades-in-arms. In 1993, former Armenian defence minister Vazgen Sargsyan founded the Yekrapah veterans’ organisation, with an aim to protect the interests of Karabakh war veterans. It soon became one of the most influential organisations in independent Armenia. After the fraudulent reelection of Levon Ter-Petrosyan in 1996, opposition leader Vazgen Manukyan brought nearly 100,000 Armenians onto the streets. Relative to the country’s small population, this was one of the largest protests in the former Soviet Union since 1992. Sargsyan, however, was pleased with the result and announced that Armenia would “march into the future with Ter-Petrosyan”. Yekrapah proved its worth, helping security forces raid opposition parties’ offices, blocking protesters from reaching the capital, and arresting more than 600. In February 1998, Sargsyan combined the ruling Republican Party with Yekrapah, which had then become politically untouchable. Ter-Petrosyan resigned in disgrace, largely for reaching a compromise with Azerbaijan over Nagorno-Karabakh. The agreement would have several territories returned to Azerbaijani control in exchange for the lifting of an economic blockade by Turkey. For many Armenians, it was nothing more than betrayal. Veterans’ House. Goris, southern Armenia, 2014. Photo courtesy of the author.Yekrapah also fell from grace. In October 1999, gunmen burst into the Armenian parliament and murdered eight politicians. Vazgen Sargsyan, by now prime minister, was killed. Yekrapah members were enraged at the loss of their leader, and conspiracy theories mounted. The object of many of them was second president Robert Kocharyan, who began to face serious challenges from the organisation as he tightened the screws on political dissent. In September 2007, Ter-Petrosyan reappeared and announced his candidacy for the 2008 elections. Amid more allegations of mass fraud, Serzh Sargsyan — and a protege of Kocharyan — took the presidency, which he still holds today. Ten died in the ensuing protests, and a state of emergency was declared. Yekrapah was divided — some, currently led by lieutenant-general Manvel Grigoryan, turned towards the authorities, while others remained loyal to Ter-Petrosyan. Ter-Petrosyan reached out to Azerbaijan like no Armenian leader since, and his fate in 1998 has doubtlessly been on the mind of Armenia’s politicians, future or present. It also underlines a raw truth: Karabakh can make Armenian politicians, and it can break them just as easily. Last week, Armenia’s president met in private with his old rival, reportedly at Ter-Petrosyan’s invitation. Neither were bound to exchange pleasantries; all talk was reportedly of Karabakh. Ter-Petrosyan later called on the country’s opposition to show support for the government during a time of crisis. Sargsyan’s declarations following the recent fighting have also been bolder. On 4 April, the president stated that Armenia would recognise the independence of Nagorno-Karabakh should Azerbaijan intensify its attacks. 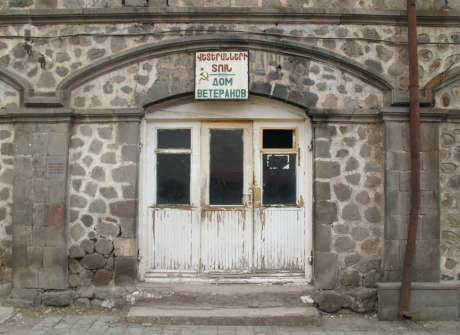 Despite the open secret that Yerevan’s bankrolls the de-facto government in Stepanakert, and the synergy between their armed forces, Armenia has not yet officially recognised the breakaway republic, which declared independence from Azerbaijan in January 1992. It’s provocative, but such a move isn’t without precedent. Armenia’s Heritage party proposed a bill to recognise Karabakh in 2007, just before Kosovo’s declaration of independence. The same move was repeated five years later, when convicted Azerbaijani soldier Ramil Safarov was extradited from Hungary and freed upon release. As Sergey Markedonov notes, recognition of Karabakh would only acknowledge facts on the ground, and so has little real strategic value for Yerevan. Armenia’s president Serzh Sargsyan at a press conference with chancellor of Germany Angela Merkel, Berlin, 6 April 2016. Photo (c): Markus Schreiber / AP Photo. All rights reserved.At a meeting with Angela Merkel in Berlin on 6 April, Sargsyan made an appeal to his nation’s martial valour that may have backfired spectacularly. “Yes, we may fight with arms from the 1980s,” he began, stressing that power is not about modern weapons or numbers of tanks, but about faith in victory. “The people’s support is the biggest thing,” concluded the president. The support is certainly there — even if it’s riddled with cynicism. There’s a perception in Yerevan, Armenian analyst Mikayel Zolyan tells me, that Armenia’s military was rather less prepared than it could have been. The broad support given to the military from both pro-government and opposition media glossed over some constructive criticism — whether of soldiers’ conditions or of military preparedness, he continues. As young men from deprived families like Karam Sloyan die on the front line, any perception of failure on that score is doubly distressing. A call for national unity at all costs drowns out cries for social justice. Coming back to that night in Goris, Vesmir’s words “Karabakh rules Armenia” strike me, with that in mind, as a depressingly simple truism.